Taking place years before his introduction in the original film, Solo introduces us to the film’s title character as he begins his smuggling career, meeting Chewbacca and Lando Calrissian along the way. This movie is better than I expected. Even from the start, I was not excited by the idea of this movie. I didn’t understand what this movie could really add to the franchise. The sequel trilogy is giving us a peek at what happened after the Empire fell, and the future of the Force. Rogue One allowed us to see the true birth of the rebellion’s best chance at overthrowing the Empire while clarifying what many considered to be a major plot hole in the original film. This film was promising us the background to a character whose role in the original film offers us enough details that I never felt any level of curiosity as to how he became a smuggler. I knew exactly as much as I needed to know to understand him as a character. Add to that the fact that Harrison Ford’s performance as that character is about as iconic as they come, and whoever was cast in that role would somehow have to live up to that, I really didn’t see how this movie could work. My concerns continued throughout the production. Original directors, Phil Lord and Chris Miller, were fired for doing exactly what you would expect Phil Lord and Chris Miller to do (namely, an openness to improvisation on set), and were replaced by the capable but unremarkable Ron Howard. The first trailer was unimpressive, including some disjointed line deliveries from Alden Ehrenreich as the title character, and was somehow improved by the addition of a terrible song from that Star Wars Kinect video game. I was certain that the only parts of this movie that I would enjoy would be those featuring Donald Glover’s portrayal as Lando Calrissian, who oozed charm even before he said a line the film’s second trailer. Despite all the behind the scenes drama and the less than promising promotional materials, this movie works surprisingly well. It has its issues, to be sure, and, similar to Rogue One, it’s not until the film’s closing act that I really start to feel invested in the story that its telling, but I didn’t walk away frustrated with the film, or hate it in any way. I’m not certain it did enough to convince me that it needs to exist, and it realistically ranks towards the bottom of the franchise (more due to how much I like the other films than what I dislike about this one) but it’s a solid entry to the franchise. I think it could move up in the ranking if it weren’t for a couple of the performances. It’s just unfortunate that both of those performances are from two of its leads. I have not seen Hail, Caesar!, Ehrenreich’s only other major credit (other than Beautiful Creatures, a movie that I didn’t know existed), but my understanding is that he does some really strong work in the Coen Brothers’ most recent film. I don’t know if he got lucky there, or if he was directed poorly here, or if he just wasn’t right for this role, but he does not do anything particularly interesting in this role. His smile leans more heavily on the arrogance of the title character, with little of the charm. His line delivery occasionally flirts with the cynical joy that Ford uses so well in the first couple of films (before he didn’t want to be in them anymore), but those moments are few and far between. I feel for Ehrenreich. This role was a huge risk, where he knew he would instantly be compared to one of the most famous film characters of all time, but whether through his fault, the director/directors’, or the producers’, he just does not come close to feeling like Han. Throw in a thinly written love story with an equally uninteresting Q’ira, played by Emilia Clarke, who I just do not see as an engaging actress (her Danerys is one of my least favorite parts of Game of Thrones, don’t @ me), and a lot of things that could really lift this movie in big ways are almost dead on arrival. Other performances lift this movie up, though. The previously mentioned Donald Glover is every bit as charming as I wanted him to be as Han’s smuggling buddy, Lando Calrissian (how that character rose from a smuggler to being the administrator of a mining colony is a way more interesting story than anything Han’s past could have provided, but I digress). Glover is on the top of his game right now, from the incredible FX series Atlanta to his rapper persona Childish Gambino, and his skills are just as present in this film. From his charming smile to his joyous line delivery, Glover does what Ehrenreich could not, and that truly feels like a younger version of a character we’ve grown to love, without feeling like a Billy Dee Williams impression. Add in the fact that he gets the most effective emotional beat in the film, and you can understand why, despite my lukewarm feelings towards this movie, I’m excited by the prospect of seeing Glover in this role again. Beyond Glover, you have strong performances from the always welcome Woody Harrelson as Tobias Beckett, Han’s mentor, and the tragically underused Thandie Newton as Val Beckett, Tobias’ wife. 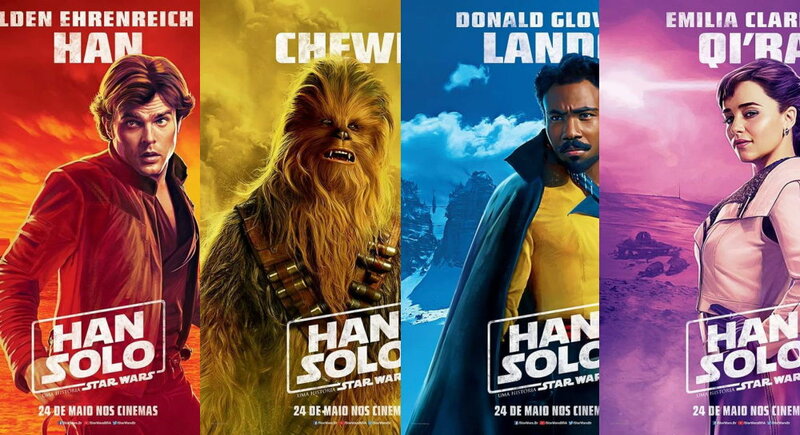 On the non-human side, Joonas Suotamo’s Chewbacca is excellent (I genuinely do not understand what goes into a performance of Chewbacca, but on the character posters, Chewbacca’s is the only one that doesn’t say the actor’s name, which is insulting, so I wanted to give him a shout-out). Finally, this film continues the streak of the spinoff films creating droid characters that are arguably more interesting than any of the human ones. Rogue One saw Alan Tudyk’s K2-SO stealing the film, and here Phoebe Waller-Bridge’s L3-37 nearly does the same thing (I’ll call it a co-steal with Donald Glover). 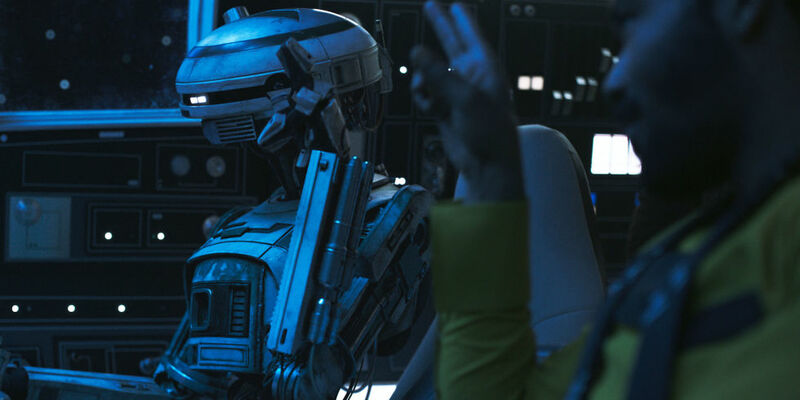 As the Millenium Falcon’s true navigator, Waller-Bridge’s droid has a delightful relationship with Lando, and has an interesting arc as she discusses the consciousness of droids, something the franchise hasn’t really done before (although the hero droids are always treated with reverence, most droids in this franchise are basically cannon fodder). As L3 joyfully leads a small revolution in the film’s second act, I was left wondering if that might have been a more interesting story. Which brings me to the film’s story, which is pleasant enough. We see Han become a smuggler alongside Chewie as he joins Beckett’s crew, and the rest of the film goes along with the plot of a major score needed to keep everyone alive. In general, I think the story is a lot of fun, it’s just that it’s dragged down by two of its leads. But even they can’t really hurt the film’s final act, as ties are broken, and a series of double and triple crosses are revealed. It’s engaging, it’s funny, we get a couple of really pleasant surprises (the reveal of the masked Enfys Nest adds an interesting wrinkle to the film’s story and the identity of Q’ira and her boss’s true employer is one that might annoy most fans of the franchise but is one I adored), and it’s the closest the film ever gets to feeling like a true Han Solo story, even if makes Han’s true “good guy” nature more explicit than I would have liked. On a technical aspect, not a whole lot stands out here. I like that the movie continues the work of the sequels in focusing more on practical creature effects, even if none of the creatures really stand out (I’m also bummed out that Therm Scissorpunch doesn’t really do anything in this movie, which begs the question of why he got a card at Denny’s, but, whatever, I’m just happy I live in a world where Therm Scissorpunch is a name). From a cinematography perspective, I don’t know if this was just the theater I was in, or what the deal was, but the first thirty-forty minutes of this movie are hard to watch as they are all shot in this dull gray that made everything look ugly and, at times, difficult to see. Musically, I really do not remember any part of John Powell’s score, except the brief moments when he calls back to the original film’s gorgeous John Williams score. I’m willing to give Rogue One a bit of a pass because Michael Giacchino had barely over a month to compose the score to that movie, but Powell has been with the project since last summer, so I can’t give him that benefit. Also, points are taken off for the confusing use of the Imperial March in an advertisement to join the Empire’s armed forces. That was….deeply strange. In the end, this movie is not as bad as it probably should have been. Director shake-ups are rarely ever a good sign, but having a known entity like Ron Howard take the reins on this movie was the right call, even if he isn’t the most interesting of directors at this point in his career. He helped settle a cast that was probably as concerned as the rest of us when Lord and Miller were fired and was able to finish a film on a tight schedule. It might not be my favorite in the franchise, but it’s still a decently worthwhile trip to that galaxy far, far away.